Where Melissa Nohemi Vergara grew up, outdoor recreation meant walking the concrete streets of East Los Angeles. At 15, she caught her first glimpse of wilderness during a Yosemite visit, and now, a decade later, she’s discovering her passions in the redwoods of UC Santa Cruz. Vergara, 25, is the first student to transfer to UC Santa Cruz from San Jose City College as a Cultivamos Excelencia Scholar. The two schools have collaborated to receive a $3.2 million U.S. Department of Education Hispanic-Serving Institutions grant under the leadership of Metas Program Director Robert Gutierrez. “We’re building a nurturing community of emerging Latina and Latino scholars bound for a world-class research experience at a University of California campus,” SJCC’s Gutierrez said. The five-year mission of the Cultivamos Excelencia Project is to motivate and retain Hispanic/Latino and other high-need students at SJCC to complete their bachelor’s degrees at UC Santa Cruz. She got her Wildland Resources and Forestry Certification with Citrus College, worked as a youth educator with Outward Bound Adventures, and volunteered with the Santa Cruz Puma Project. 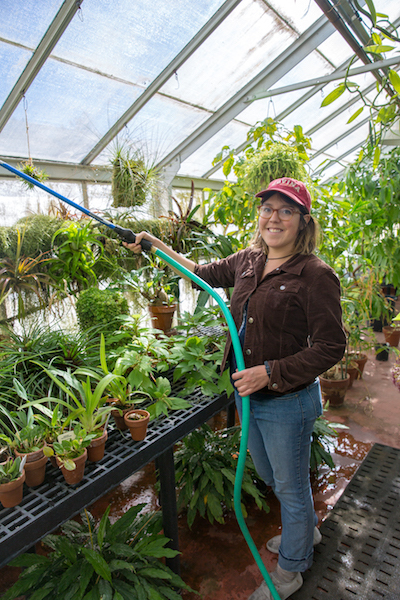 Now, just a few weeks into her first quarter here, she is working as an assistant at Thimann Labs, which has rooftop instructional greenhouses on campus, and she plans to declare a plant science major. As a Cultivamos Excelencia Scholar at SJCC, Vergara got help with transfer and scholarship applications, and assistance with admission and course planning. She was matched with Katherine Ennis, a Ph.D. research mentor in Environmental Studies at UCSC. The college is in the process of hiring more doctoral students to serve as mentors. Vergara, the daughter of Mexican immigrants and the only English speaker in her family, is one of 5,567 Hispanic/Latino students offered admission to UC Santa Cruz this fall. “Latino/Latina students, who now constitutes a critical mass on our campus—29 percent in 2013—bring a wealth of knowledge and skills that are critical for UCSC’s continued success as a leading public research university in California,” says Elizabeth Gonzalez, who is leading the partnership and undergraduate research related to the Cultivamos Excelencia grant. Recently, a group of SJCC student members in the second cohort of Cultivamos Excelencia Scholars visited UC Santa Cruz to tour the McHenry Library and explore its journals and databases essential to research. Each scholar received a library card with comprehensive access through the remainder of the academic year. Among them was Veronica Garcia, one of the 21 scholars enrolled in the program, who talked about the struggles she’s had as a first-generation college student. Her first tries at community college ended with her dropping out to work and raise her daughter, now 11. Garcia didn’t give up on school, though, and she expresses gratitude for the support she’s gotten so she can someday become a behavioral psychologist.